I took my morning trip down to Hayden Valley this morning. I watched as a small herd of bison swam across the river as I entered Hayden. Since they were running toward the road I decided to turn back toward Canyon (after taking my obligatory pictures). 1/4 mile back toward Hayden I came across a motorcycle accident that happened about 30 seconds before I got there. There were 2 riders on the bike and both were on the pavement in obvious pain, but at least conscious. The two cars in front of me stopped to help and since in cases like this I tend to be the designated panic-er (at least I assume I would be, maybe I would hold it all together) I made sure that the Rangers had been contacted and left the area so not to cause congestion at the site. This is the 3rd motorcycle accident that I have personally come upon this summer. I worked in the Fountain with sporadic stops at Confections to relieve others for breaks and lunches. This weekend I had 5 people stop in and say 'hi' to me who read this blog. One couple is from Wales. I wish I had more time to visit with everyone but duty called and I had to get back to work. But thanks to you all!! It's always nice to meet people who read this and/or contact me by e-mail. The road between Fishing Bridge and Grant was closed once earlier today because of smoke. The closure became permnant later in the day. It will not reopen until there is a snowfall as the fire has now reached the road. After work I picked up Rosie and we headed up Dunraven to look at the fire, which now has the name the Arnica Fire. When we got up there we noticed that we could also see the fire which is now somewhere by Cody. We had heard about a fire in that direction last Thursday. In fact on my way back from Cody on Thursday I kept seeing forest service trucks and even a helicopter on the ground. I didn't see any smoke in that area and didn't know what to think about it all. Now I know. After dinner I headed toward Yellowstone Lake. East of Fishing Bridge I stopped by the lake and took some pictures of the sun setting behind the smoke. It was actually quite beautiful as the smoke and sky turned orange. I could see tiny dots that were actually helicoptors or planes flying through the smoke. When I headed back I ran into Jack & Rosie by some bison in the road. They were heading to Lake Butte Overlook too see if flames could be seen from there. I turned around and followed them. Right before Lake Butte we came across a rollover accident. At this point I'm begining to wonder if I have some kind of supernatural aura that causes me to come across accidents. The car was smashed and was being loaded onto a flatbed. I don't know the condition of the driver. Anyway, once up on Lake Butte we didn't see any flames but could see the orange smoke as the sun set further. Coming back by Sedge Bay I finally saw some flames licking the sky. The smoke turned red as the fire burned below. This blog is about the things I see, experience and feel in Yellowstone. I highly recommend that if you want any official and up-to-date reports on anything you read here that you go to the YNP website. And B-I-N-G-O was my name, Oh! 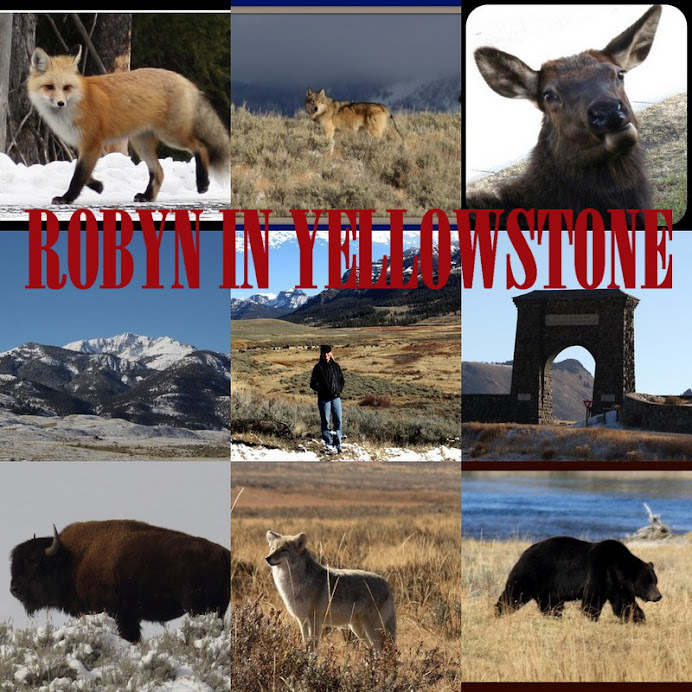 I created this blog so that family and friends can keep updated on my wildly fantastic adventure in Yellowstone National Park. I have worked for Yellowstone General Stores/Delaware North Company since 2009. I started at Canyon General and have worked the winters at Mammoth General Store. I was the Manager of the Adventure Store during the summer of 2010 and the beginning of the summer of 2011. I am now the year-round Manager of the Mammoth General Store.